Recently I was contacted by a talented designer. Olivia Stackhouse is not just talented but she has vision as well and an eye for style and fashion. 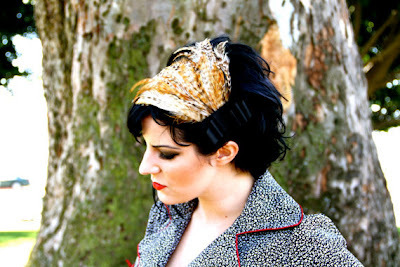 In her time since graduating from college, she has created her own brand, the Lazy Leopard, which is filled with simple but beautiful pieces from feather hair fascinators to embellished hats, barrettes, headbands and more. The designs are simple and yet there is a flair of sass and personality to every piece in her collection and each piece is uniquely different from the last as well. Olivia sells both on her own Lazy Leopard website where she has a gallery of her work as well as takes custom orders. She also has a shop over at Big Cartel by the same Lazy Leopard Boutique title. In both locations you'll find a wonderful variety of beautiful products to browse through that are perfect for everyday wear or fashion forward dressing for special occasions, weddings and more. YOU CAN CLICK ON THE PICTURE ABOVE TO VISIT OLIVIA STACKHOUSE'S LAZY LEOPARD ON BIGCARTEL AND TAKE A LOOK AROUND OR, IF YOU PREFER, YOU CAN CLICK RIGHT HERE! If you like what you see in the Lazy Leopard shop, you may also enjoy visiting Olivia Stackhouse's blog or stopping by to say hi to the artist on Facebook!